Please RSVP via ticket link to reserve your spot! Fired up about the Green New Deal? Want to learn more? Join 32BJ SEIU, 350 BK, Indivisible Nation BK, One Queens Indivisible and Sunrise NYC for an inspiring and informative Green New Deal Town Hall! We’ll be hearing from policy experts, elected officials, and advocates about what a Green New Deal could look like and connecting to climate justice in a whole new way. There will be story telling, action tips, exciting speakers and more! Program and featured speakers to be announced soon. Follow this space for updates and make sure to reserve your tickets below. After the town hall, we’ll reconvene at a nearby bar to continue the movement and conversation over drinks. Ready to take your activism to the next level? It's time to Womxn Up Your Activism! Join INBK and learn more about strategic protesting, birddogging, civil disobedience and more with our featured speakers, Jennifer Flynn Walker of the Center for Popular Democracy, and L.A. Kauffman, author of "How to Read a Protest." Join INBK to hear from veteran organizer Ashley Sanders about her work with Extinction Rebellion (XR) and the role civil disobedience can play in the climate movement. We’ll also be writing climate justice postcards. Join us for our March general meeting! We’ll be hearing from Zakiyah Ansari from the Alliance of Quality Education about school funding and the budget process in Albany, and brainstorming our next steps to resist Trump and fight for our communities on a federal and state level. Plus we’ll have new #GreenNewDeal postcards to write! Featuring Congressman Jerrold Nadler and Congresswoman Carolyn Maloney, as well as State Senate Deputy Majority Leader Michael Gianaris, Chairman of State Senate Committee on Elections Zellnor Myrie, State Senator Liz Krueger, State Senator Brian Benjamin, State Senator Robert Jackson, State Assembly Member Richard Gottfried. Additional speakers to be announced. A healthy democracy prioritizes and empowers the people it represents. A healthy democracy welcomes average citizens contributing to make their communities better. But for far too long, big money politics and the systematic disenfranchisement of voters has been chipping away at those ideals. We have the power NOW to re-ignite and re-engage the people and build a stronger democracy, but we need our elected representatives to lead the charge. Doors open at 1:00PM. Town Hall begins at 1:30PM. Seating will be first come for ticket holders. Our new DEMOCRATIC Congress takes office on Thursday, January 3rd. We'll be hosting events across the city at our representatives' offices to deliver letters, share our priorities and tell them to BE BOLD. Then join us for a rally at 5:00 pm at 780 Third Avenue outside Senator Schumer and Senator Gillibrand's offices to send them the same message: BE BOLD in 2019. If you have a different MOC and would like to organize your own visit-- please get in touch! Just when you thought election season was over in New York, we still have on very important election left — Public Advocate! 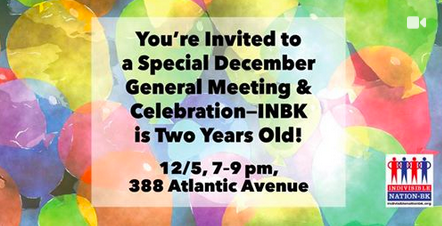 Please join moderators Ben Max and Alyssa Katz and INBK, Central Brooklyn Independent Democrats, Bay Ridge Democrats, Brooklyn Young Democrats, Ernest Skinner Political Association, LAMBDA Independent Democrats, New Kings Democrats, North Brooklyn Progressive Democrats, Independent Neighborhood Democrats, Shirley Chisholm Democratic Club and Southwest Brooklyn Democratic Club to meet and hear from all the candidates. 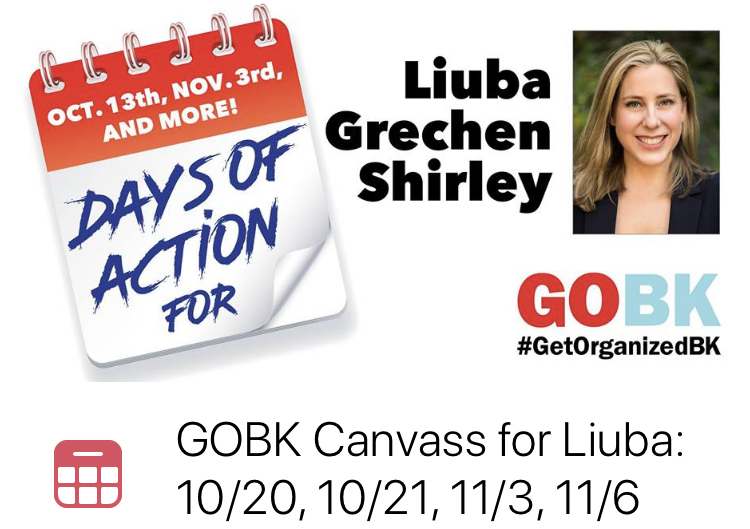 Join Get Organized BK to knock on doors and get out the vote or Liuba Grechen Shirley on Long Island! Join us to get out the vote for NY-2 Democratic candidate for Congress, Liuba Grechen Shirley! RSVP through our email listserv or by emailing info@indivisiblenationbk.org by Oct 29th. The location will be emailed out on 11/4. Join us to get out the vote for NY-2 Democratic candidate for Congress, Liuba Grechen Shirley! RSVP through our email listserv or by emailing info@indivisiblenationbk.org by Oct 29th. The location will be emailed out on 10/31. Join us to text bank for the blue wave! You will need a laptop. Email info@indivisiblenationbk.org for details and location by 10/15. FB event HERE — invite your friends! It is an easy train ride or drive away! We'll have experienced organizers on hand to train you and provide support. Register to vote by October 12th! Saving our democracy and protecting our communities starts and ends with the VOTE. New York: You have until Oct 12th to register to vote in the November 6th election! We have a chance to flip more than five House seats and multiple state Senate seats in New York this November. If you want to vote out the GOP and hold Trump accountable, this is our best chance to do so. EVERY VOTE WILL COUNT. If you want to mail your application, IT MUST BE POSTMARKED BY FRIDAY, OCTOBER 12. DO IT NOW. You can also drop it off at your local Board of Elections by that date! Want to check your registration and polling place and make sure you’re still on the rolls? Spread the word and share this post with friends and family via Facebook, email, or text. even if you know just one person who isn’t registered, reach out and send them this information!